We’ve spent the past week grilling some of the world’s top hair stylists, makeup artists and manicurists backstage at the Fall 2015 collections. The result? This selection of brilliant beauty tips that work just as well IRL as they do on the runway. It’s time to get schooled. For the ultimate wearable smoky eye, layer taupe eyeshadow over brown liner, like James Vincent did on models at Charlotte Ronson. “The nice thing about a taupe eyeshadow is it works on its own, but it kind of makes everything bionic,” he explains. “You can go in with a taupe shadow and then line over it, and the taupe will hold everything in place but also give dimension and depth. And it always looks like a natural shadow.” An added bonus: incorporating a taupe shadow, such as the Mehron E.Y.E. Powder in Cocoa that Vincent used backstage, ensures that your makeup will look the same in any lighting (helpful for those moments when you find yourself under unflattering fluorescents). Why let the number of nail polishes in your collection limit your creativity? Remix existing shades by layering them and adjusting their opacity. At Thakoon, manicurist Gina Edwards diluted an iridescent purple polish (Morgan Taylor Something to Blog About) with topcoat and layered it over a pale pink (Morgan Taylor Sweet Surrender) to create a “sheer haze” that evoked the moon reflecting off a glacier. Want to add a little sparkle to your eyes but hate the way those cheap tinsel-accented lash strips look? Make your own subtly sparkling falsies like Diane Kendal’s team did for Carolina Herrera. The makeup artist and her crew applied clear Duo Adhesive to the tips of MAC 33 Lash bundles and sprinkled them with MAC Pro Silver Glitter to make models look like they’d just emerged from the water. “It’s going to be a lot of metallics next season,” predicts Nonie Crème, who used the silvery Party Girl polish from her new Colour Prevails line to paint models’ tips at Honor. 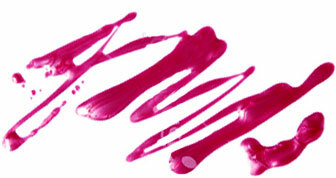 To avoid streaks when using a nail color with a metallic finish, “never skip base coat,” she warns. You can skip top coat with metallics, though, because they’re made to shine without anything on top. When the humidity level drops, your foundation formula can dry out the upper layer of your skin, leaving your complexion with a chalky quality. But Sir John, Beyoncé’s go-to makeup artist, has a solution. Backstage at Tracy Reese, he blended luxe moisturizer with foundation to give skin a luminous look. “We’re in the dead of winter so we wanted to make sure the girls’ skin stayed supple throughout the day. That’s why I mixed the Cellular Radiance Cream by La Prairie into the foundation,” he said.